Features, Selections: 45 Drink, Columns and Selections: 5 Trays - 9 Columns per Tray, Capacity: 360 - 405 items depending on package size, Heavy Duty Welded All Steel Construction, MDB Protocol for, Coin Changer and Bill Acceptor, Glass Front Live Display, Multiple Pricing From $0.05 to $99.95, Automatic Service Diagnostics, Secure Anti-Theft Locking System, Ideal for Indoor or Outdoor Environment. 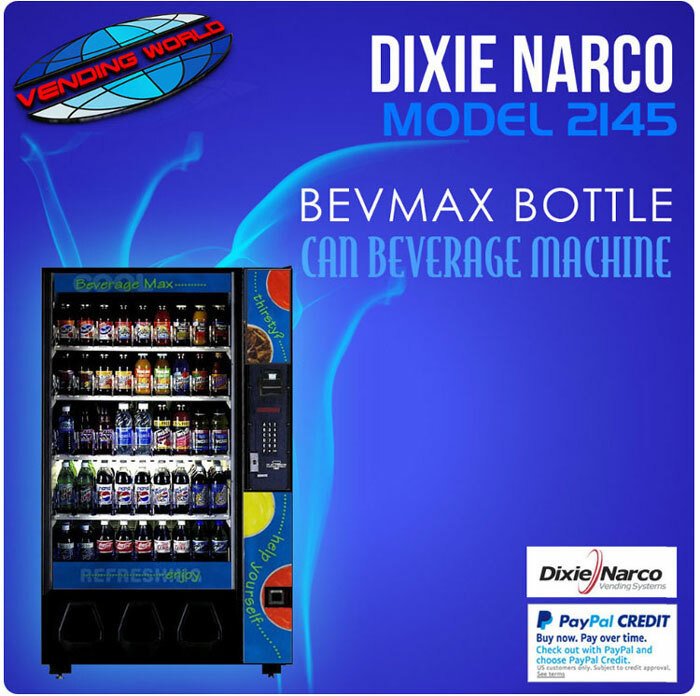 You are buying a used Dixie Narco model 2145, 12oz cans and 20 oz bottle as well as 16 oz energy drinks Vending Machine. This machine is a multi-priced meaning. The unit has 45 different selections and accepts $1/$5 bills and coins with a high capacity coin mech. Refurbishing Process: Soda machines; we give these machines a general cleaning with our pressure washer. The machines are cleaned inside and out then sanded, painted. Rebuilt coin mechs and dollar bill validators are then installed. New graphics are installed on the front of the machine. A final checkout is done with coins and dollar bills to ensure proper operation. Every machine includes a lock and two keys for our customers’ convenience. Actual machine looks similar to the machine in the picture. Cold drinks Graphics on front of machine. These machines are A-rated, completely refurbished machines. These machine vend 400+ 12 oz cans. These are not 'club store machines' and current models of this brand of machines sells for over $6000 new. Used by professional vending machine operators.